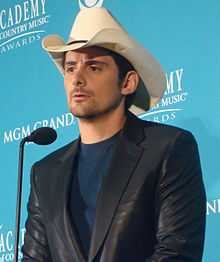 Brad Douglas Paisley (born October 28, 1972) is an American country music singer and songwriter. Starting with his 1999 debut album Who Needs Pictures, he has released eleven studio albums and a Christmas compilation on the Arista Nashville label, with all of his albums certified Gold or higher by the RIAA. He has scored 32 Top 10 singles on the US Billboard Country Airplay chart, 19 of which have reached number 1. He set a new record in 2009 for the most consecutive singles (10) reaching the top spot on that chart. Paisley has sold over 11 million albums and has won three Grammy Awards, 14 Academy of Country Music Awards, 14 Country Music Association Awards, and two American Music Awards. He has also earned country music's crowning achievement, becoming a member of the Grand Ole Opry. Paisley also wrote songs for Pixar's Cars franchise ("Behind the Clouds", "Find Yourself", "Collision of Worlds" (along with Robbie Williams), "Nobody's Fool", etc.). Paisley was born on October 28, 1972, in Glen Dale, West Virginia. He is the only child of Douglas Edward "Doug" Paisley, who worked for the West Virginia Department of Transportation, and Sandra Jean "Sandy" (née Jarvis) Paisley, a teacher. He was raised in Glen Dale, West Virginia. He has stated that his love of country music stems from his maternal grandfather, Warren Jarvis, who gave him his first guitar, a Sears Danelectro Silvertone, and taught him how to play at eight years old. In third grade, he performed for the first time in public by singing in his church. Initially, they were just going to have him play the song on the guitar instead of a piano. But then the adults heard him sing the tune and said, "forget the choir, let's just have Brad do the whole thing." After that, he never had to ask for a gig until he left Glen Dale. He later recalled that "Pretty soon, I was performing at every Christmas party and Mother's Day event. The neat thing about a small town is that when you want to be an artist, by golly, they'll make you one." 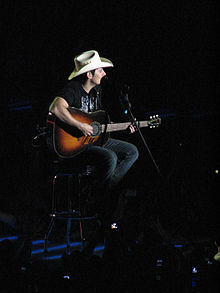 At age 13, he wrote his first song, "Born on Christmas Day", which later appeared on his album Brad Paisley Christmas. He had been taking lessons with local guitarist Clarence "Hank" Goddard. By 13, Goddard and Paisley formed a band called "Brad Paisley and the C-Notes", with the addition of two of Paisley's adult friends. Within a week after graduating from Belmont, Paisley signed a songwriting contract with EMI Music Publishing; and he wrote David Kersh's "Top 5" hit, "Another You", as well as David Ball's 1999 single, "Watching My Baby Not Come Back". The latter song was also co-written by Ball. Later in 2000, Paisley won the Country Music Association's (CMA) Horizon Award and the Academy of Country Music's best new male vocalist trophy. He received his first Grammy Award nomination a year later for Best New Artist. On February 17, 2001, Paisley was inducted into the Grand Ole Opry. He was 28 when he accepted the invitation. PBS did a 75th anniversary concert special, in which Paisley and Chely Wright sang a song that they co-wrote called "Hard to Be a Husband, Hard to Be a Wife". This song later appeared on the compilation album Grand Ole Opry 75th Anniversary, Vol. 2. The concert would get a CMA nomination for Vocal Event of the Year. Paisley would later contribute to Wright's 2001 album Never Love You Enough, co-writing the tracks "One Night in Las Vegas", "Horoscope", and "Not as In Love". Paisley co-produced the former two tracks with her, in addition to playing guitar on them and featuring members of his road band, The Drama Kings; he also sang backing vocals on "One Night in Las Vegas" and "Not as In Love". In 2002, he won the CMA Music Video of the Year for "I'm Gonna Miss Her (The Fishin' Song)". Several celebrities made notable guest appearances in the video, including Little Jimmy Dickens, Kimberly Williams, Dan Patrick, and Jerry Springer. His three other singles from the Part II album, "I Wish You'd Stay", "Wrapped Around", and "Two People Fell in Love", all charted in the top 10. The album stayed in the charts for more than 70 weeks and was certified platinum in August 2002. To support his album, he toured the country as the opening act for Lonestar. Paisley also contributed two original songs to the Disney Pixar's film Cars. These can be found on the film's soundtrack. This was in recognition of his contribution to the "Route 66: Main Street America" television special. His track "Accidental Racist", a duet with rapper LL Cool J, generated a bit of notoriety when it was released. Paisley sings about how he finds himself "caught between Southern pride and Southern blame": Paisley explained that he's proud of where he's from, but he's ashamed of themes such as slavery and racism. The song generated controversy for its discussion of racism, particularly the song's message of showing "Southern pride", which includes reappropriation of the Confederate flag. On April 6, 2014, Paisley released "River Bank." It is the lead single from his tenth studio album for Sony Music Entertainment, Moonshine in the Trunk, which was released on August 26, 2014. Paisley co-wrote the song with Kelley Lovelace and co-produced it with Luke Wooten. The album's second single, "Perfect Storm", was released to country radio on September 2, 2014. It reached number one on the Country Airplay chart in January 2015. The album's third single, "Crushin' It", was released to country radio on January 26, 2015. The album's fourth single, "Country Nation", was released to country radio on September 14, 2015. Love and War features several collaborations with iconic artists, including Timbaland, John Fogerty, Bill Anderson, and Mick Jagger, as well as a songwriting credit with Johnny Cash. On October 4, 2018, Paisley and his wife Kimberly Williams-Paisley partnered with Belmont University and opened a free referral-based grocery store in Nashville to help the community in need. The Board of Trustees for The Store include Brad Paisley, President; Megan Zarling, Chair; Pete Fisher, Vice-Chair; Doug Paisley, Secretary and Elaine Bryan, Treasurer. Other board members include Sarah Cates, Jaynee Day, Hope Fisher, David Minnigan, John Zarling, Olivia Munn, John Schario, Scott Scovill, Michael Stagg, Becca Stevens and Kimberly Williams-Paisley. Executive Director is Gina Hancock. In November 2018, Paisley released "Bucked Off" the lead single from his upcoming studio album. On March 11, 2019, Paisley released "My Miracle"
Paisley released his book Jug Fishing for Greazy and Other Brad Paisley Fishing Stories in 2003 under Thomas Nelson Publishing. He co-wrote the book with author M. B. Roberts. In the last months of 2000, Paisley had a relationship with fellow country music singer Chely Wright. Unbeknownst to Paisley, Wright and her female partner had moved together into a new home earlier in the year. In her autobiography, Wright expressed regret for how she treated him. He is also a lifelong fan of the Cleveland Browns and Los Angeles Dodgers. Paisley sang the National Anthem at Dodgers Stadium before Game 2 of the Dodgers vs Astros World Series in 2017, and again before Game 3 of the 2018 World Series against the Boston Red Sox. Paisley also sang the national anthem before a game during the 1999 season, and stated in an interview with ESPN his dream job would be to play football for them. He also invited former Browns Quarterback Brady Quinn to a concert at the Blossom Music Center, in 2008. Paisley is also a fan of West Virginia athletics. In 2014, Paisley appeared as a celebrity guest picker on the popular ESPN show College Gameday, when it was held on the campus of West Virginia University. In 2015 Santa Cruz Guitar Company introduced the Brad Paisley Signature Model, B/PW, acoustic dreadnought guitar. 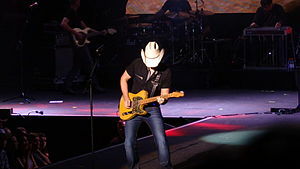 Paisley is often seen playing this model of guitar, such as in the 2017 Netflix original Brad Paisley's Comedy Rodeo. 2013 Late Night with Jimmy Fallon Himself Pros & Cons - Campaigning For Anthony Weiner, Jimmy Fallon & Brad Paisley Sing "Balls In Your Mouth"
2014 Two and a Half Men Derek Guest role: "Oh WALD-E Good Times Ahead"
Rising Star Expert Along with singers Kesha and Ludacris, and Host Josh Groban. The Voice Himself/Adviser Team Blake in the Battle Rounds from Season 9. ^ "Brad Paisley Biography". The Ellen DeGeneres Show. Archived from the original on 2014-10-27. Retrieved 2014-06-09. 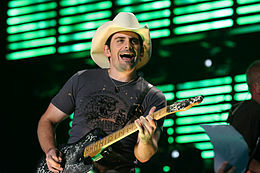 ^ "Alumnus Brad Paisley Establishes Endowed Scholarship for Curb College Students". Belmont University. March 28, 2012. Archived from the original on May 2, 2014. Retrieved May 2, 2014. 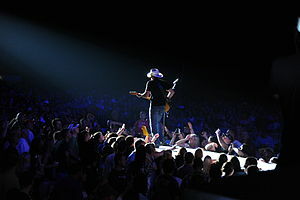 ^ "Brad Paisley Falls Off Stage in S.C. (Video)". Right Celebrity. 2010-03-07. Archived from the original on 2013-03-29. Retrieved 2013-04-09. ^ "Brad on Mark Twain: words & music CD". 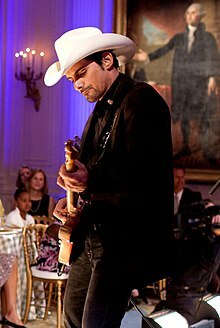 Bradpaisley.com. Archived from the original on 2012-01-25. Retrieved 2012-09-16. 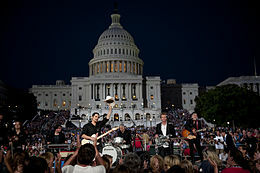 ^ "30 Country Music Stars Join Forces for Historic CMA Music Video, 'Forever Country'". Abcnews.go.com. September 16, 2016. Retrieved April 25, 2017. ^ Jim Asker (October 20, 2016). "LoCash Leaps to No. 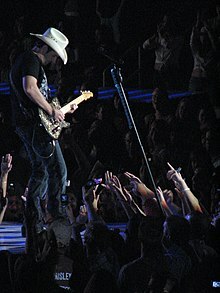 1; Brad Paisley's New Pinnacle; Garth Brooks Bows". Billboard. Retrieved April 25, 2017. ^ "New Brad Paisley Album Features Timbaland, John Fogerty, Mick Jagger". Sounds Like Nashville. 2017-03-10. Retrieved 2017-03-13. ^ Dukes, Billy (November 13, 2018). "Brad Paisley's 'Bucked Off' Is His Turbo Honky–Tonk Song [Listen]". Taste of Country. Retrieved January 9, 2019. ^ "Brad Paisley Premiers New Single, "My Miracle" At Country Radio Today". Brad Paisley.com. March 11, 2019. Retrieved March 19, 2019. ^ Roberts, Soraya (May 2, 2010). "Country singer Chely Wright set to announce she is lesbian in next People Magazine: report". New York: NY Daily News. Archived from the original on 4 May 2010. Retrieved 2 May 2010. ^ Johnson, Beth (July 16, 2009). "Kimberly and Brad: City Girl, Country Boy". Good Housekeeping. Archived from the original on February 28, 2010. Retrieved February 18, 2010. ^ "33". Supreme Council 33º, SJ. September 20, 2013. Archived from the original on September 22, 2013. Retrieved 2013-09-20. ^ Turner, Mimi (March 11, 2004). "10 Burning Questions with Brad Paisley". ESPN. Archived from the original on December 15, 2009. Retrieved 2010-02-18. ^ "Brad announces involvement in new TV show". 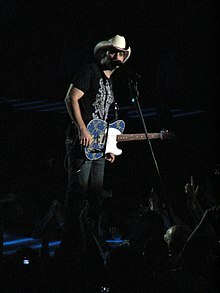 BradPaisley.com. October 15, 2009. Archived from the original on April 12, 2010. Retrieved 2010-02-18. ^ a b c Meeker, Ward (January 2012). "B.P. 's VIPs: Two Vital Guitars from the Collection of a Modern Superpicker". Vintage Guitar. pp. 34–35. ^ "Hand Made Boutique Guitar Effect Pedals | Signature Series | The Paisley Drive". Wampler Pedals. Archived from the original on 2013-03-31. Retrieved 2013-04-09. 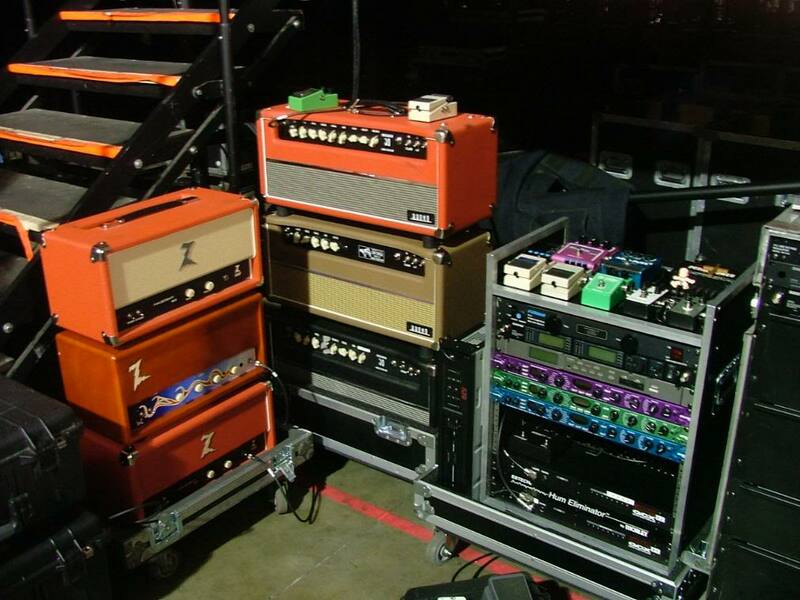 ^ "Photograph of Brad Paisley Rack". Audiotechusa.net. Archived from the original on 2012-10-29. Retrieved 2013-04-09.